Fall is here, and Halloween will soon follow. For me Halloween brings back memories of excitement and anticipation. 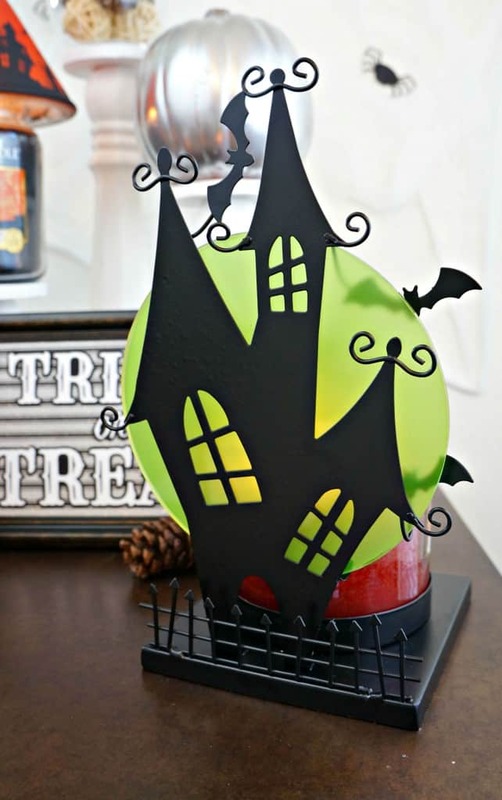 Memories of spooky corn mazes and trick or treating, and of course decorating with simple and spooky Halloween home decor pieces. I loved Halloween as a kid and I am very much looking forward to celebrating this year with my family. I am sharing a simple and spooky Halloween display today plus be sure to watch this spook-tacular video from Yankee Candle and claim your Buy One Get One candle coupon. 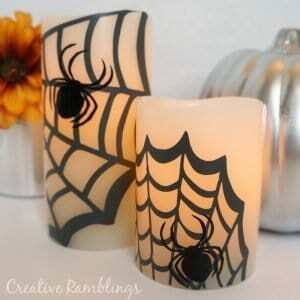 These candles are great for decorating for Halloween…and every season. When I decorate for a season or holiday I like to keep things simple. I am all for a festive home, but I like to do it without overwhelming my entire house. 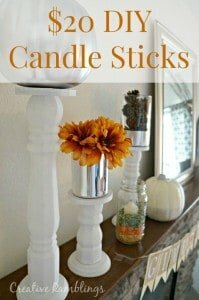 I do this by using neutral pieces, a few fun holiday accessories and candles. I am a big fan of Yankee candles, they have amazing fragrances that fill my home quickly. The right fragrance many times makes my home more festive than the decor. For this simple and spooky Halloween Home Decor I used 2 really fun Yankee Candle accessories that you can get this season. This Halloween Silhouettes Batty Haunted House Jar Candle Holder has a full moon behind an eerie haunted house silhouette, it can hold a large or medium jar candle. 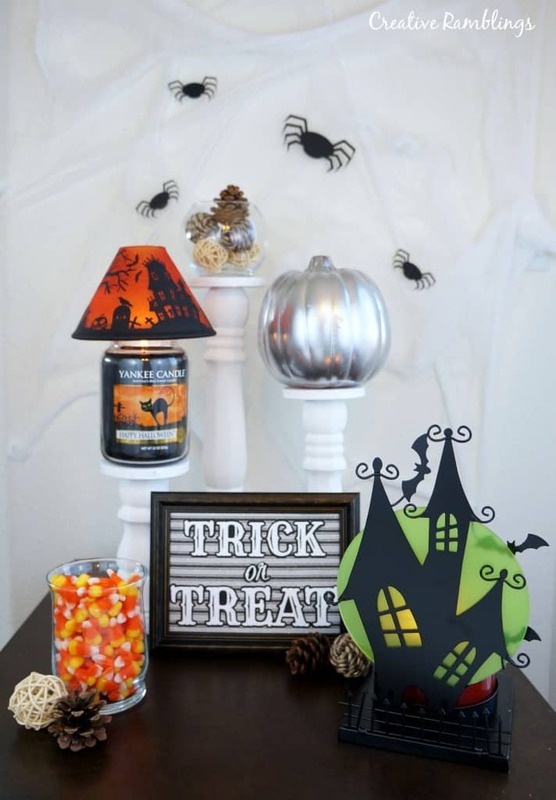 This Halloween Silhouettes Haunted House Jar Candle Shade has spooky silhouettes and crackled orange glass that look fabulous on top of large and medium jar candles. I combined these accessories with the Yankee Candle Happy Halloween Scented Candle, a scary good and hauntingly purr-fect potion of black licorice spiced with anise and cloves. This candle perfectly sums up Halloween in a fragrance and makes my house smell amazing. You can get this candle, and any other fragrance you like with an amazing Buy One Get One Coupon! 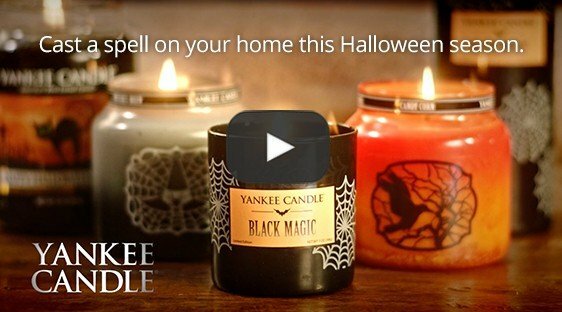 Watch this fun Yankee Candle video and claim your coupon at the end. I used a few DIY items in my simple and spooky display, you can find links to these projects at the end of this post. To create this look I started with white wood pillars, adding height to any display is a great way to add interest. I added glass containers filled with small baubles and candy. Spider web and spiders on the wall make it extra spooky. 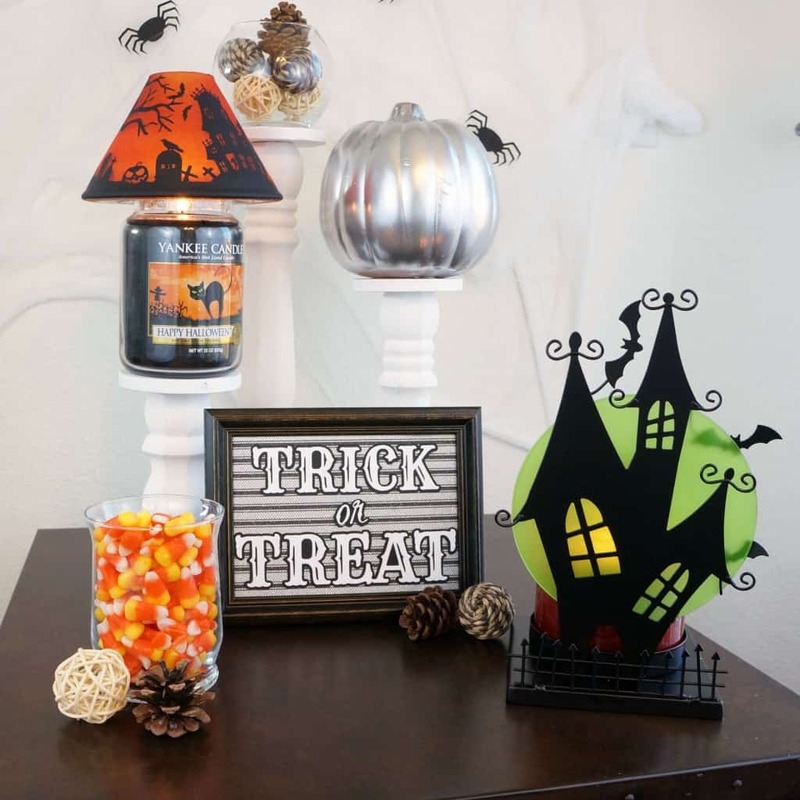 A simple picture frames with cut out letters spelling Trick or Treat is a fun way to pull it all together. I love how my simple DIY pieces look with these amazing smelling candles and spooky Halloween accessories. I had a blast putting this Halloween home decor together and my family is now officially in the Halloween spirit. Be sure to get your Buy One Get One large candle coupon and start decorating with Yankee Candle. Thanks Mandy, have a fun Halloween. These are so cute and BONUS the house smells great with it too. 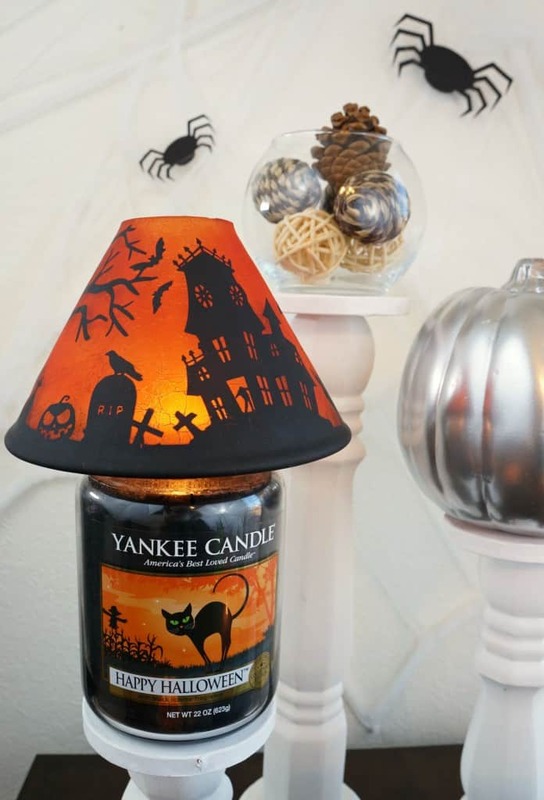 I didn’t know Yankee made Halloween candles; I’ll definitely be checking them out. Right?! My house smells so good lately. Yes, definitely check them out. Thanks for stopping by Sydney.